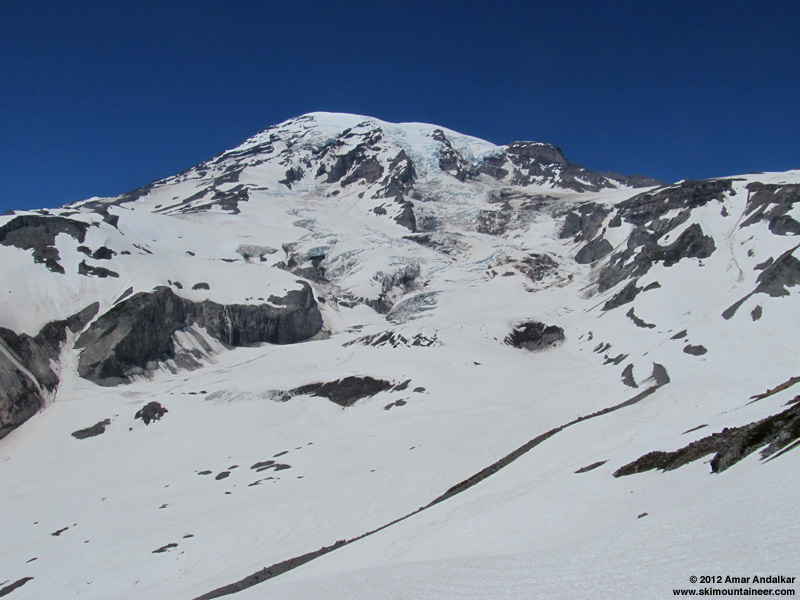 Summary: The Kautz Glacier was in unexpectedly fine condition for a ski descent this week, with smooth corn from the edge of the summit dome down to the crux 45-50� chute at 12000 ft, and again below 11200 ft down the Turtle snowfield and Wilson Glacier to about 7000 ft. The chute had several inches of recent snow over bare gray glacial ice, well-bonded but becoming patchy in the ongoing sunny weather -- this crux will be bare ice for 30-50 vertical ft within a few days. Also note that the 20 ft vertical rock chimney at 11200 ft (which must be climbed to exit the route, with a fixed line in place as usual) is totally bare of snow, the most difficult I've seen it in my 4 times there, especially with skis on pack constantly hitting the loose rock overhead while climbing. Easily the worst part of this route right now, but not bad enough to detract from the awesome skiing. About 9500 ft of total ascent and descent, with over 99% of that skiable from the summit back to the car, mostly on smooth corn snow. 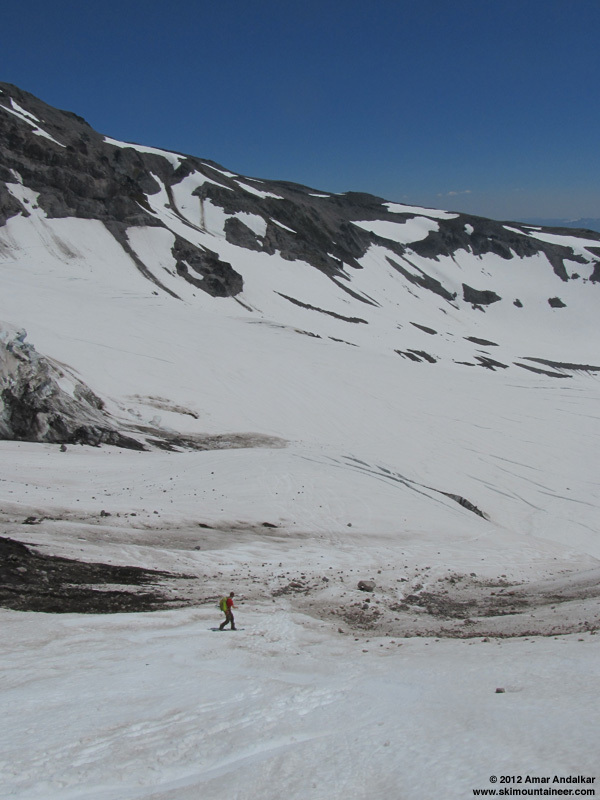 An outstanding ski descent in a magnificent wild setting on the Mountain, especially so for July. 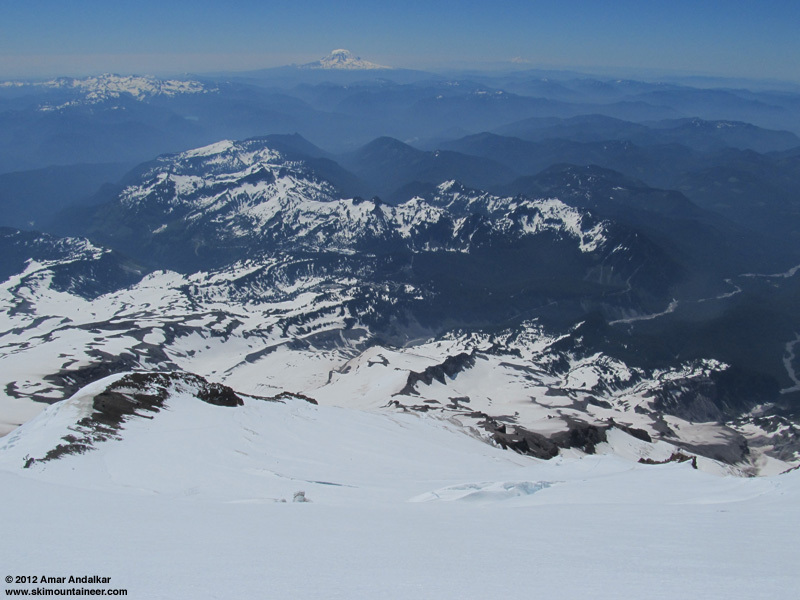 Normal and zoomed views of the Kautz Glacier from Ricksecker Point on the afternoon of July 10, with several climbers barely visible in the Kautz chute. 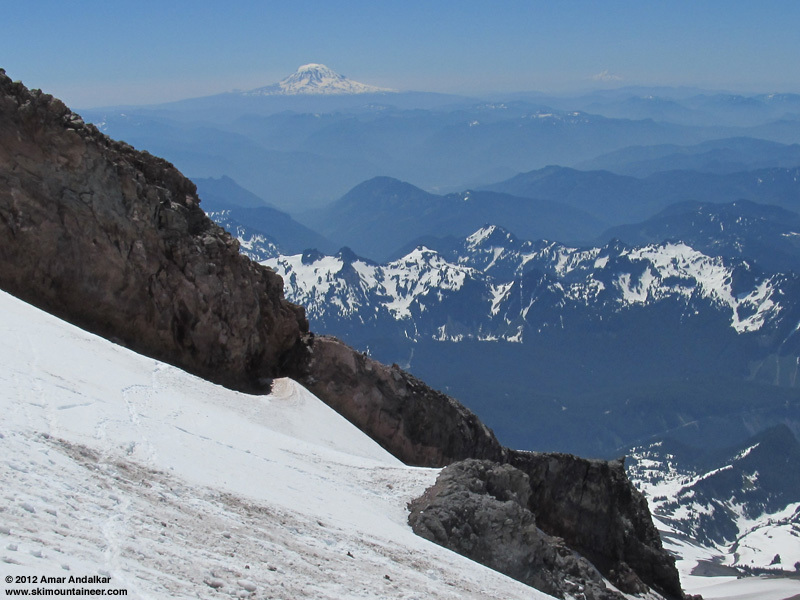 We decided to ascend via the DC after a night at the Camp Muir hut and drop down the Kautz from the summit, a safe plan since we would get an excellent view of the route and crux from Kautz Creek and Ricksecker Point along the road. We would skin up from 4th Crossing trailhead on Paradise Valley Road, in order to skin continuously to Muir via Paradise Glacier and avoid the several bare sections on the standard Pan Point route now. I had previously skied the same exact route solo on July 18-19, 2010 (see TR), and also starting from Paradise in May 2008 (see TR). We started skinning only a few feet from the road just after 5pm, still way too warm for comfort. The hot day soon faded to a cool evening of long shadows, with literally millions of ice worms out on the surface of the glacier (100s of them per square meter). Reached Muir around 8:30pm, well before sunset, and settled in for a comfy night in the not-very-full hut. 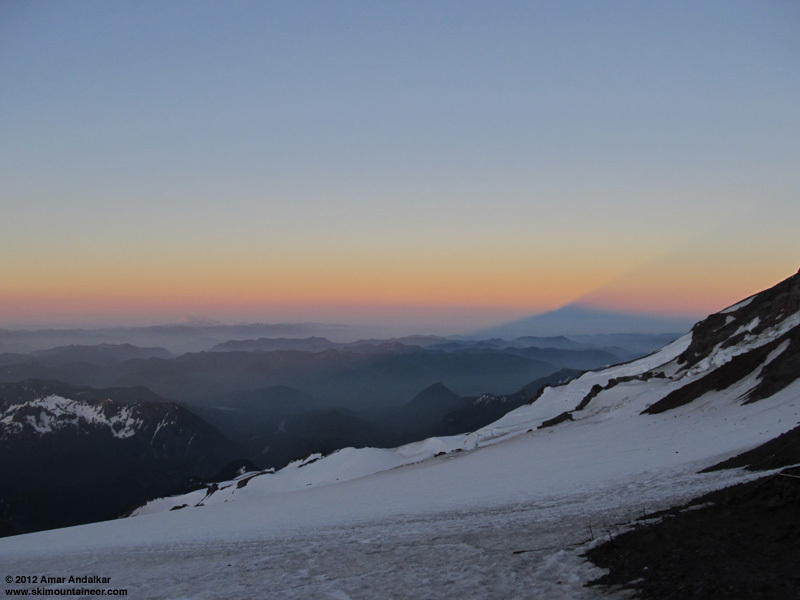 The extremely hazy and smoky air made for a mediocre sunset looking south. Up at 5am the next morning, watching the sunrise at 5:30, and planning to leave at 6am. It was closer to 6:30 when we actually got going, but not a big worry. 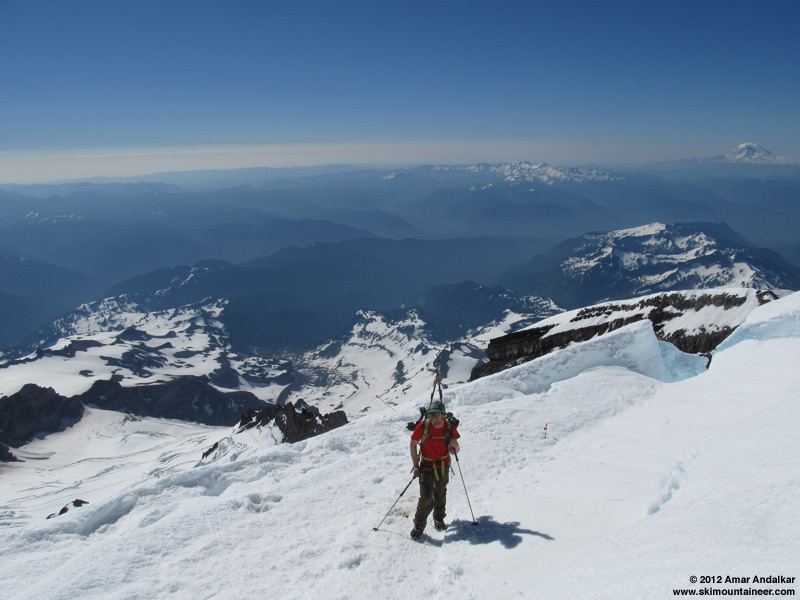 Cramponing with skis and boards on packs, wearing harnesses and glacier gear, but the rope stayed in Kyle's pack. 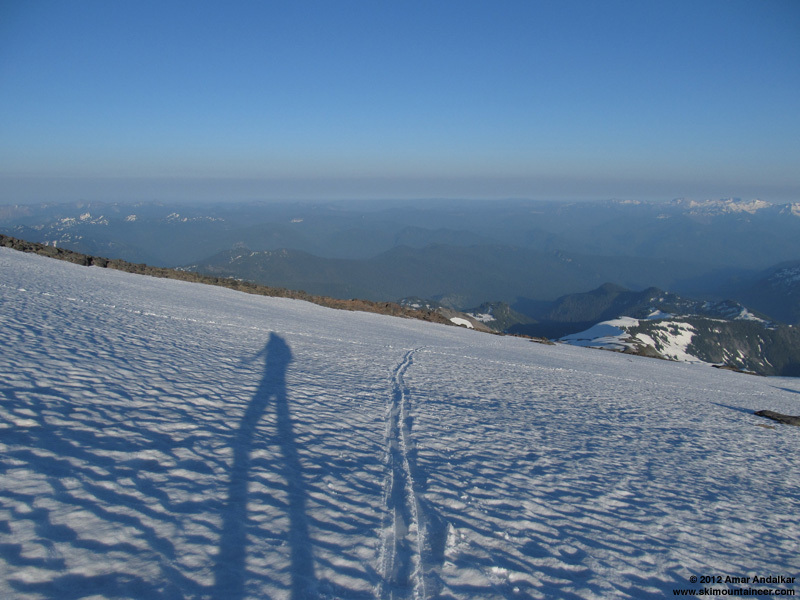 The snow was fairly well-frozen by radiational cooling overnight despite a freezing level of 15000 ft and temps which never dropped below 47 �F at Muir. A few minor cracks to cross in several spots, but nothing open more than a foot wide, excellent conditions for mid-July. 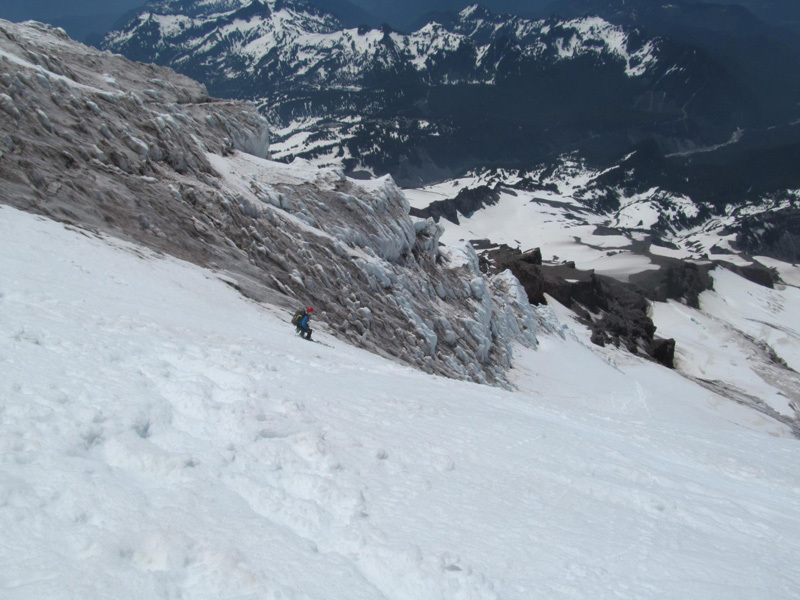 The DC route was actually in quite reasonable shape for a ski descent, with only a single short (100 ft flat) bare section at the bottom of the Cleaver, and about 150 vertical ft of bare ground at Cathedral Gap. 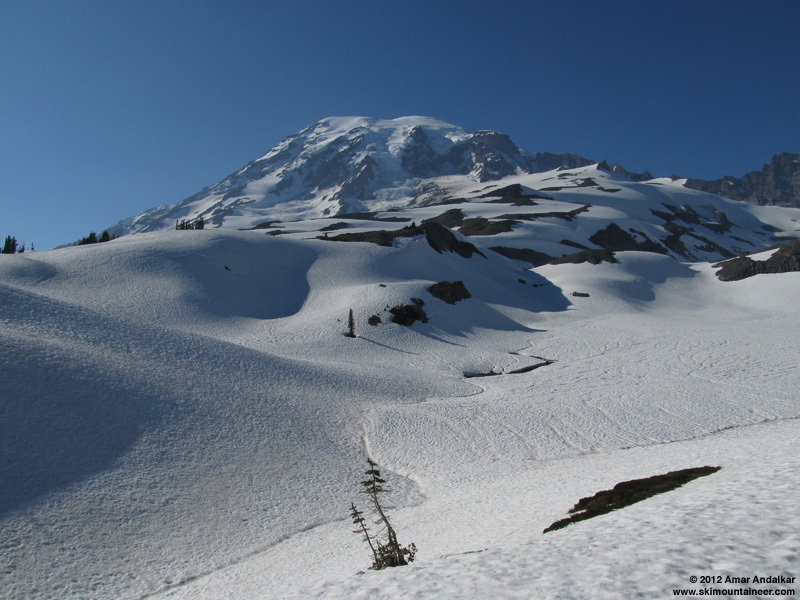 The route is almost 99% snow-covered from Paradise to the summit, outstanding for July. 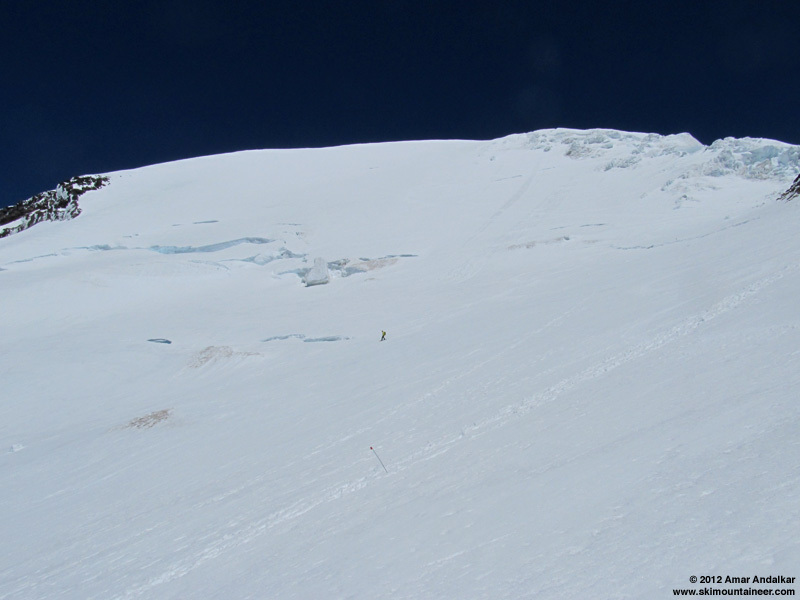 Not too many climbers on the route this day, certainly far less than a weekend, and no other skiers that we saw. 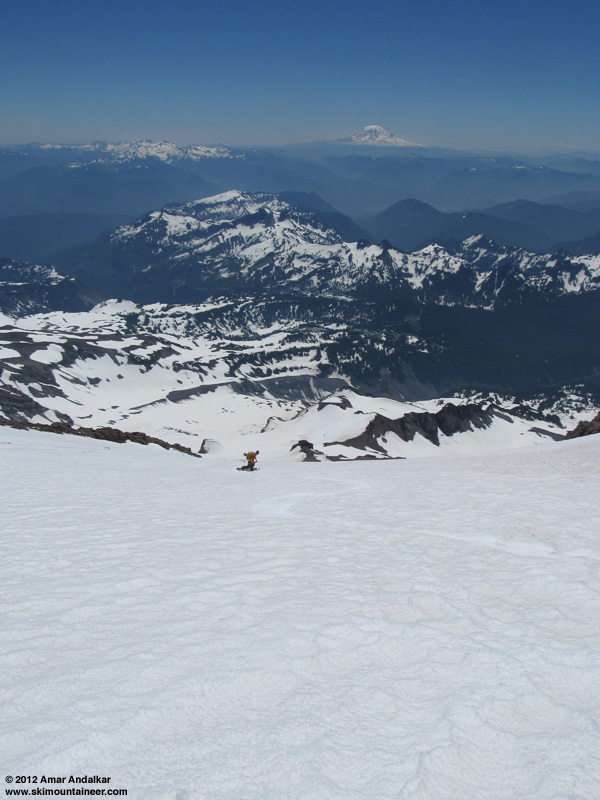 I was dragging for unknown reasons, moving way slower than I expected (and compared to my partner), but we still reached the crater rim before 11am and topped out on Columbia Crest shortly afterwards. 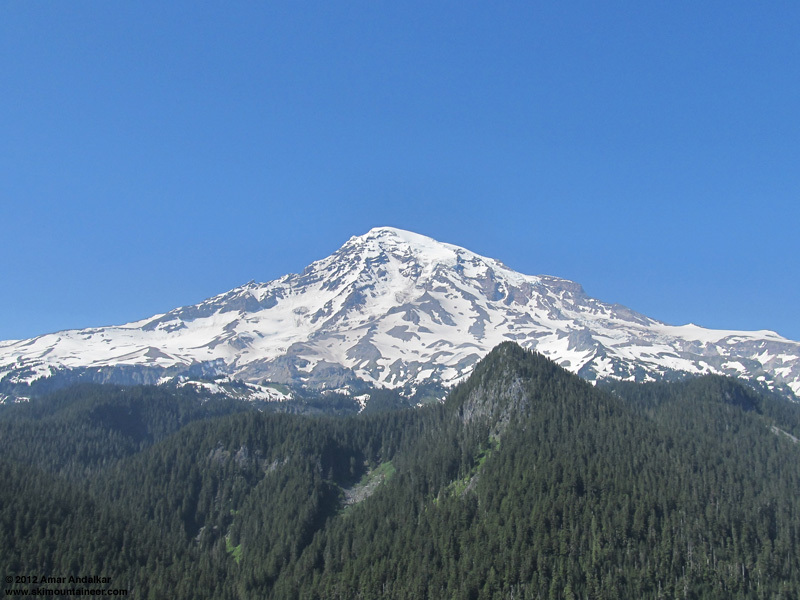 Just amazingly beautiful weather for my 25th Rainier summit and Kyle's 7th(? ), clear and almost calm, winds under 5-10 mph and temps above freezing. Even the smoke and haze had lessened considerably from the day before. 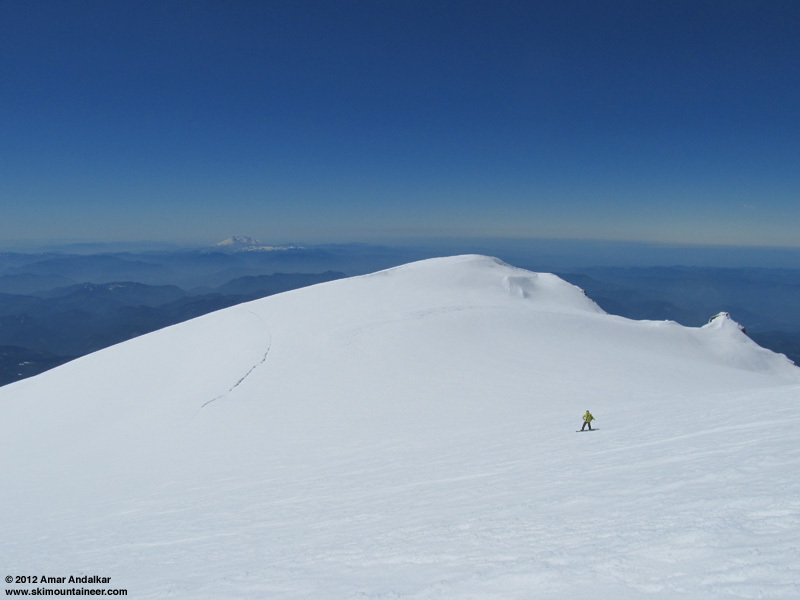 We skied down into the West Crater at 11:45am, with slightly firm conditions still on these flat westerly aspects, but softening to excellent smooth corn as we crossed the rollover east of Point Success onto the 40-degree steep open face of the upper Kautz Glacier. 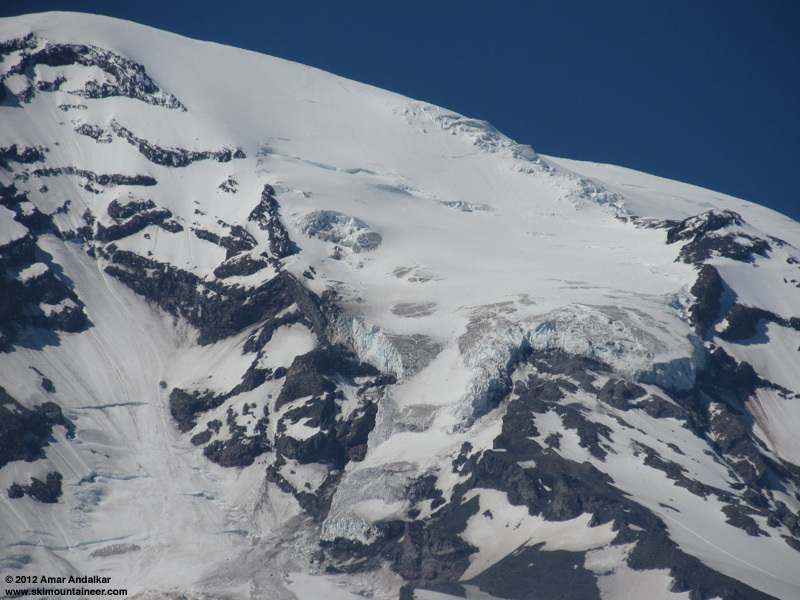 Numerous cracks are opening on the upper glacier, including many that are a foot or two wide, plus a few that are dozens of feet wide. A combination of sweet wide open turns, plus some cautious skiing to weave around the big cracks and across the thin ones, brought us atop the crux just after noon: the Kautz Ice Chute, which really was bare ice back in April this year, but has refilled with snow during the ongoing spring storms to transform into skiable condition. 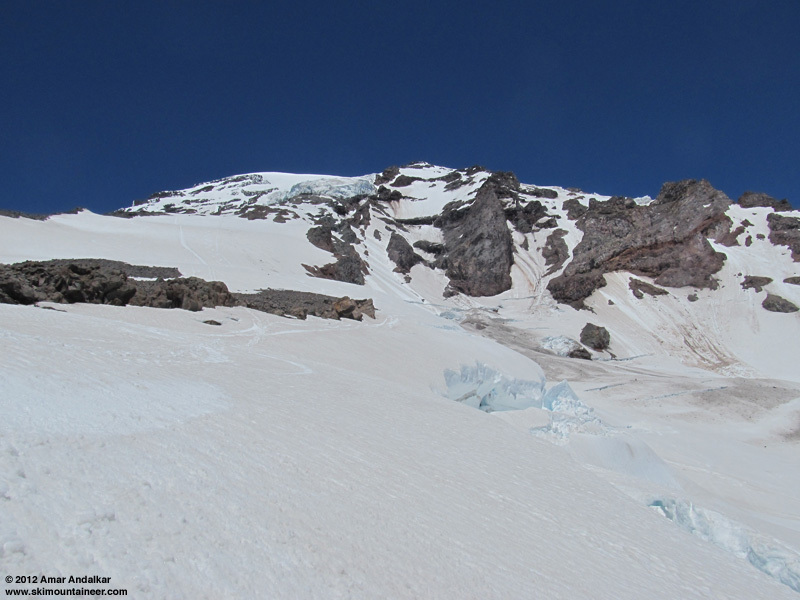 However, the recent hot sunny weather has been quickly melting the spring snow in the chute, which was now only several inches deep over bare gray glacial ice, well-bonded but becoming patchy. Cautious side-slipping and a few turns brought us through the crux, then down another short stretch of smoothish corn before angling left under the ice cliff to the relative protection of the rocky cliff. A guided group of climbers had descended the chute earlier, and was now ascending the 20 ft rock step / chimney at 11200 ft. Back in July 2010, this spot was completely filled with snow, and no climbing was necessary, but this time I was glad to have the security of a top-rope belay (we sent one end of our glacier rope up with the last member of the guided group). The rock is hideously loose here, a volcanic conglomerate of fist-to-head-size boulders embedded in a matrix of solidified ash, with frozen drips of water ice atop the rock in spots on this well-shaded west aspect. Anyway, we were soon up and past the rock, and a short horizontal traverse brought us to a finger of skiable snow at the edge of the Turtle. Even as 1pm neared, ski conditions remained good on the Turtle, smooth slightly-dusty corn if you stayed away from the numerous boot tracks. Very stable too, with minimal sluffing even on the numerous steep rollovers down the Turtle and the edge of the Wilson Glacier. Looking back up, the Fuhrer Finger looked to be in mediocre shape for skiing (dirty, rocky, runneled) and the Fuhrer Thumb looked very marginal (all that, plus 2 large open bergschrunds at the bottom). 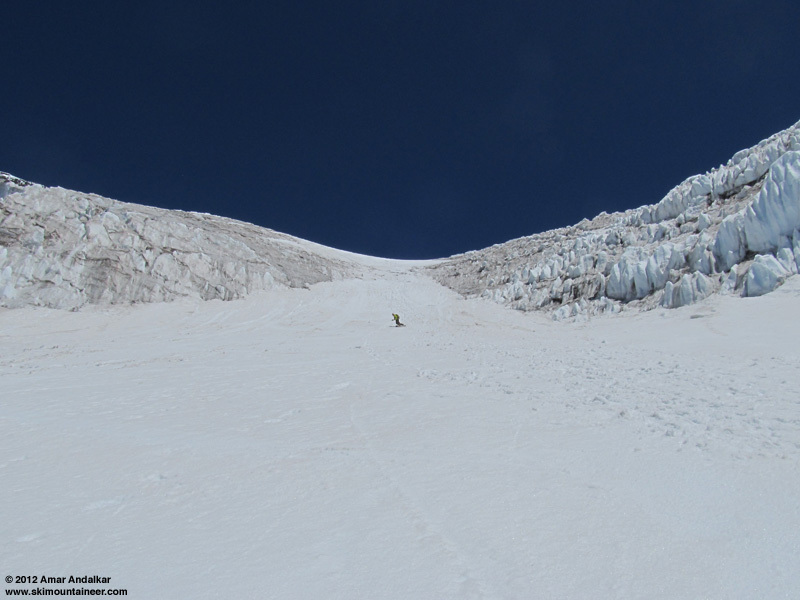 The Wilson Glacier is a maze of huge open crevasses now, but these are easily avoidable if one sticks to the proper route along the edge. 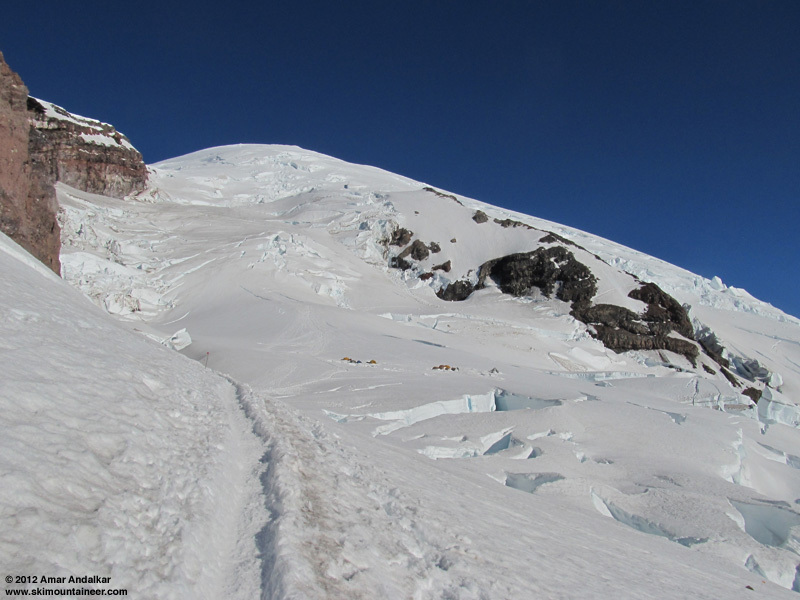 The exit bowl from the Wilson onto the Nisqually Glacier is in poor shape, with lots of fallen rock and ice, but still passable on skis. 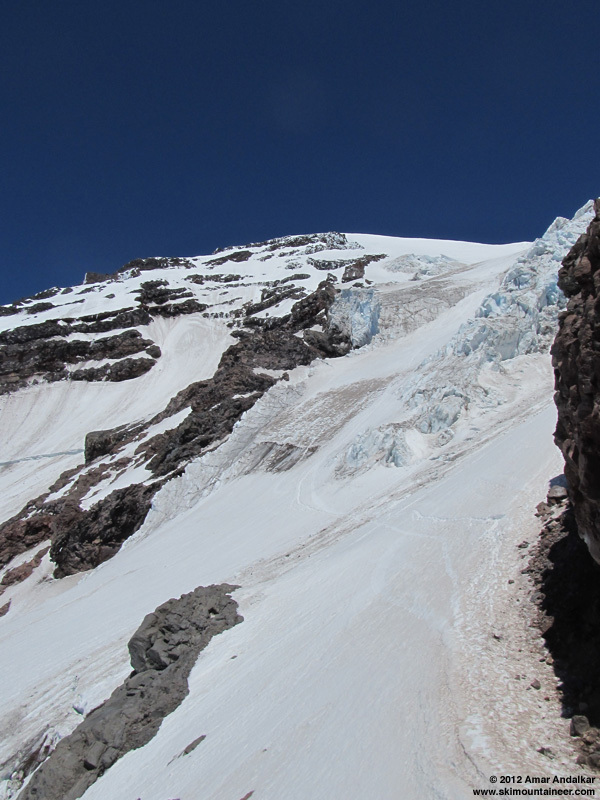 Lots of cracks are opening on the traverse across the Nisqually Glacier too. We reascended back up to Glacer Vista (me on skins, Kyle booting), and then starting with a downward-angling traverse east across Edith Creek Basin, skied all the way back to the road at 4th Crossing just after 2pm. About 9500 ft of total ascent and descent in just over 21 hours car-to-car, a very fine use of such an excellent weather window. And among the best spur-of-the-moment ski descents I've ever done, one of the few I've undertaken with so little planning on the great Mountain, made much easier by having skied the route twice before. 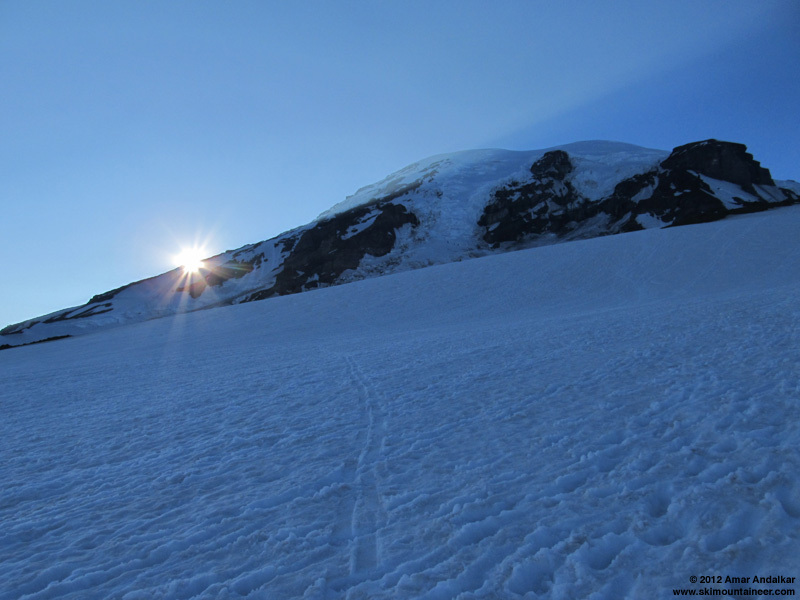 The Kautz Glacier is a excellent ski route when in good condition as it was now, and in my opinion is among the steepest of the reasonable ski descents on Rainier, those which do not require accepting a very high degree of risk of a fatal fall in order to ski. SYNOPSIS...HIGH PRESSURE ALOFT WILL REMAIN OVER THE REGION THROUGH WEDNESDAY. EXPECT A WEAK UPPER LOW TO MOVE OVER THE REGION ON THURSDAY BUT IT WILL HAVE LITTLE IMPACT ON THE AREA. REST OF TODAY...SUNNY. FREEZING LEVEL 14000 FEET. TONIGHT...MOSTLY CLEAR. FREEZING LEVEL ABOVE 15000 FEET. WEDNESDAY...SUNNY. FREEZING LEVEL 14500 FEET. WEDNESDAY NIGHT AND THURSDAY...MOSTLY CLEAR. FREEZING LEVEL ABOVE 15000 FEET. THURSDAY NIGHT...MOSTLY CLEAR. FREEZING LEVEL 14500 FEET. FRIDAY...MOSTLY SUNNY. FREEZING LEVEL 13500 FEET. FRIDAY NIGHT AND SATURDAY...PARTLY CLOUDY WITH A SLIGHT CHANCE OF SHOWERS OR THUNDERSTORMS. SNOW LEVEL 12500 FEET. SATURDAY NIGHT THROUGH MONDAY...PARTLY CLOUDY. FREEZING LEVEL 14500 FEET. This was my experience each of the 4 times I skied with Kyle! Nice report as usual, Amar. Me too what's the deal with that guy. I had a great trip Amar and I didn't even get a sunburn. Conditions look great up there. Skied baker today, conditions were horrible (mank, non-transformed glop above 6500 ft). I need to get down there. As expected, a few more days of warm weather and sunshine have finished off the Kautz Glacier as a worthwhile ski route for this season. 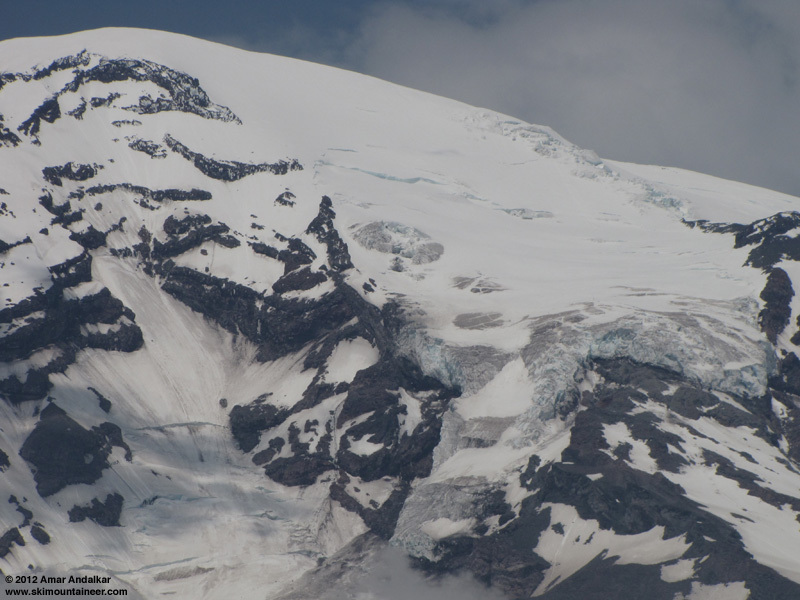 As of today July 14, both the main crux in the steepest part of the Kautz ice chute near 11900 ft and the lower ice band near 11400 ft have melted out to bare gray glacial ice. Any ski descents after this point will require sideslipping or rappelling over a few dozen feet of bare ice at each location. Very glad to have skied this route in the nick of time this year! nice trip you guys ! Any ski descents after this point will require sideslipping or rappelling over a few dozen feet of bare ice at each location. Or just build a kicker! Funny I was thinking the same thing.